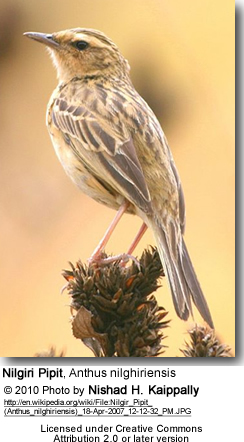 The Nilgiri Pipit, Anthus nilghiriensis is a 17 cm long near threatened bird species. It is endemic to the Western Ghats in South India. It is closely associated with short montane grasslands interspersed with marshy grounds and small streams mostly in hill slopes above 1500 m of Tamil Nadu and Kerala. Large populations are found in Upper Bhavani River basin and Bangithapal village areas at the southern end of Mukurthi National Park. Among 3321 ha of surveyed area, 14 ha of Upper Bhavani has the highest breeding density of the Nilgiri Pipit. They are also found in the Kalakkad Mundanthurai Tiger Reserve. The Nilgiri Pipit breeds between March and June. It nests inside the marshy grasslands near streams and uses the surrounding grass areas for feeding. Loss of habitat to various anthropogenic activities is the primary reason for decline in the population of the Nilgiri Pipit.